From NSP - Nature's Sunshine - Stimulates mental learning ability - a neurotransmitter. Contains potent antioxidants which are utilized in the synthesis of neurotransmitters and has a positive effect on energy. 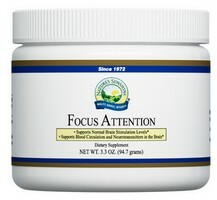 Nourishes Your Thinking Spot for children and adults with over-stimulated and undernourished brains. Perfect for children in need of mental nourishment. Cedarwood oil may facilitate an impassioned sense of protection, wisdom and abundance. Lycopene and alphalipoic acid are powerful antioxidants that can pass the blood-brain barrier to protect brain cells from destructive free radicals. Provides essential building blocks for health and development, enhances brain growth and development. Supports the brain, eyes and central nervous system. From NSP - Nature's Sunshine - Tonic for ailments of the nervous system, including epilepsy, schizophrenia and memory loss. It builds circulation in the brain and lower limbs.